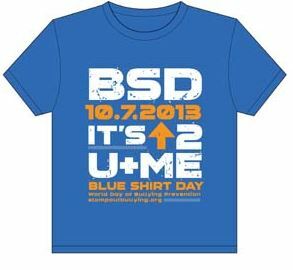 Order your shirt today and get ready for BLUE Shirt Day 2013. STOMP Out Bullying™ announces its partnership with Bon-Ton Stores Inc. for the Fifth Annual BLUE SHIRT DAY™ WORLD DAY OF BULLYING PREVENTION to kickoff National Bullying Prevention Awareness month during October. The BLUE SHIRT DAY™ WORLD DAY OF BULLYING PREVENTION is an initiative of STOMP Out Bullying™ to combat bullying and cyberbullying. As students prepare to return to school, the one thing many are not looking forward to is being bullied. That is the reality for many victims at school, on playgrounds and online. In fact 13 Million kids will be bullied this year in the United States. To signify the importance of National Bullying Prevention Awareness month, STOMP Out Bullying™ created Blue Shirt Day™ World Day of Bullying Prevention. It is observed on the first Monday of October. On this day, we ask kids and adults alike make Monday, October 7th, the day that bullying prevention is heard around the world by wearing a Blue Shirt in solidarity to STOMP Out Bullying. With the new school year beginning, this is a call to action for students, schools and workplaces across the country. Thousands of schools across the country have agreed to participate and many more are expected to join. This year’s campaign sponsored by Bon-Ton Stores, Inc. not only offers a newly designed “2013 limited edition” blue shirt, but offers a PSA created by SJI Associates, animated by Ataboy Studios, produced by Delusions NY and distributed by Tylie Jones. The song “Stand Up” was donated by Sugarland. The PSA will air on major TV and cable networks, as well as online. Additionally, a social media campaign will be a large component of the campaign. STOMP Out Bullying offers students a safe haven. From information and resources, to an online area where youths can talk about the issue, to getting involved in social media efforts, an area where students can upload videos about their experiences with bullying and why they want to end bullying and a HelpChat Line for kids and teens who are bullied, cyberbullied and at-risk for suicide. Created in late 2011, the HelpChat Line has helped over 7600 students and saved 84 lives to date. We ask kids, teens and adults to participate in BLUE SHIRT DAY™ WORLD DAY OF BULLYING PREVENTION by wearing the STOMP Out Bullying™ “2013 Limited Edition” blue T-shirt or wearing their own blue shirt – as long as they GO BLUE! Shirts are available at www.stompoutbullying.org and bonton.com/bts. The price of each shirt is $12 and Bon-Ton Stores Inc. will donate $8 of each sale to STOMP Out Bullying. In addition to being the official BLUE SHIRT DAY™ WORLD DAY OF BULLYING PREVENTION sponsor, Bon-Ton Stores Inc. has created an interactive social media campaign that offers shoppers discounts and an additional donation. To launch the program, Bon-Ton will host a back-to-school sweepstakes on their Facebook page from August 5 – September 7th. Visit facebook.com/bonton for details. It is critical to educate students about the harmful effects of bullying and cyberbullying. They can begin by observing and participating in BLUE SHIRT DAY™ WORLD DAY OF BULLYING PREVENTION and National Bullying Prevention Awareness month. – 1 out of 4 kids are Bullied. – 9 out of 10 LGBT students experience harassment at school. To learn more about helping your kids and teens handle bullying or if your child is a bully, visit www.stompoutbullying.org.